For those of you who know me, you’ve likely heard the punchline of this toast before (credit to BP). The funny thing about Cusco, is in spite of the fact that we’re inland, we’re constantly reminded of all the (friend)ships around us. We knew that one of the hardest sacrifices of making a RTW trip was going to be missing our family and friends back home. Fortunately, with the use of “Viber,” we haven’t missed a beat! The application allows you to call, text and video chat internationally for free. In fact, we’ve been communicating (when we can get wifi) with a lot of our family and friends even more than when we were in the US! It’s funny how that works. So, the fact that our contingency from home is “with” us has been great. But we’ve felt the impact of friends in a significant way here as well. It started with our host, Manuel, and his family. Since we’ve been a part of their home for three weeks now, they regularly use the phrase “you are family now.” And they mean it. What’s theirs is ours, and they truly want us to feel as though we are blood relatives. One thing I’ve noticed about Peruvian culture is they don’t issue empty sentiment. If they say something to you, it’s authentic (unless they’re trying to sell you something on the street). Last week we celebrated Manuel’s birthday with a special breakfast and they had a barbeque in the afternoon. Karen and I couldn’t attend the barbeque, so the family set aside full plates of food for us when we returned home from volunteering. Gestures like that really help one to know that family and friends are always near. We’ve also picked up friends in some more unusual circumstances. In the middle of last week we were walking down Avenida El Sol when a furry friend from the street happened upon us. He had a limp in his step, but for some reason decided to trot next to us on our walk to the bakery and cafe. Well, wouldn’t you know it, he continued to follow us for almost two miles before we stopped into the bakery. At that point, he laid down and waited for us to order. We completed the order, he got back up, and we continued on to the cafe. This continued for the better part of an hour, until he finally got caught up with some other dogs and lost track of us. We looked out from the cafe and saw him looking around for us even after we left. Manuel’s theory was that he “picked up on our good energy.” I felt the same way, because I tried to feed him food and he wouldn’t have it. A similar occurrence happened at our volunteer job late last week. We were winding down towards the end of our shift, and the little niece of the head cook at the cafe was walking around looking for something to do. I was washing some dishes and when I looked up, she and Karen were sitting together at a table laughing with one another. They were looking at videos and even busted out the Photobooth app on Karen’s Ipad. Within minutes they were making silly faces and crying from so much laughter. I think God just wanted us to know that friends are all around us in many different forms. Sometimes it’s in the obscure form of an animal or a little Peruvian girl, and other times it’s more palpable. A more palpable occurrence happened last week when we received our first piece of mail in South America. Mail is fun to receive when you haven’t had any in awhile, but edible mail provides another level of excitement. The adopted mother of the Kimble family, Phyllis Keenan, sent us a box full of cookies and butterscotch bars, our absolute favorite treats! We originally met Phyllis through her daughter Katherine, who is one of our best friends and my former co-worker. She has been an incredible supporter of our journey and an ever constant reminder of the love of friends all around us, wherever we go! To top things off, our travel companions Dan and Nichole Rudenga joined us on Saturday for a week full of adventures! We spent some time in Cusco before we will head to Machu Picchu, with intermittent stops in the Sacred Valley, Quillabamba, Cocalmayo, and Aguas Calientes. Thanks to our friends Mike and Alaina Smith, we will be joined by some wonderful travel prayers and protection sent via mail! It’s certain to be an unforgettable experience. Check out our week three recap video below! Pan campesino is to the Kimbles as blue meth is to Walter White. Even when we have some, we’re thinking about more! Prior to arriving in Peru, we knew relatively little about what to expect in the way of food. Now that we’ve had a taste, we feel qualified to give our two cents (how do you convert that into Peruvian soles?). The categories of food below are broken up into the following: things you know, things you probably don’t know and things we still have to try. 1. Avocados: They are so green and the perfect consistency. I never imagined in my life that I would be fighting Karen for the last bite of avocado! 2. Ceviche: This dish is a type of raw (usually local) fish cooked in lime or other citrus juices. Local Peruvians often eat ceviche after a long night of drinking to cure their hangovers. If you’re a seafood fan, this is right up your alley! 3. Mangoes: Rainy season in Cusco is also mango season. If you enjoy mangoes in the United States, you will be blown away by the size, flavor and juiciness of these incredible fruits! 3. Pan campesino: Karen and I take a trip to the panadería (bakery) about every other day. One of our staples has been the pan campesino (peasant bread), which is similar in flavor to a delicious wheat bread. 5. Queso Andino: Say cheese! This Andean cheese is pasteurized, unlike much of the cheese sold in the region. We didn’t want to test our stomachs too much so we went the safe (and delicious) route. We often pair this with none other than…pan campesino! 6. Starbucks: Before you lose your cool on why we included this, let me explain. The Starbucks in Cusco is the only Starbucks in the world which uses organic coffee beans! 1. 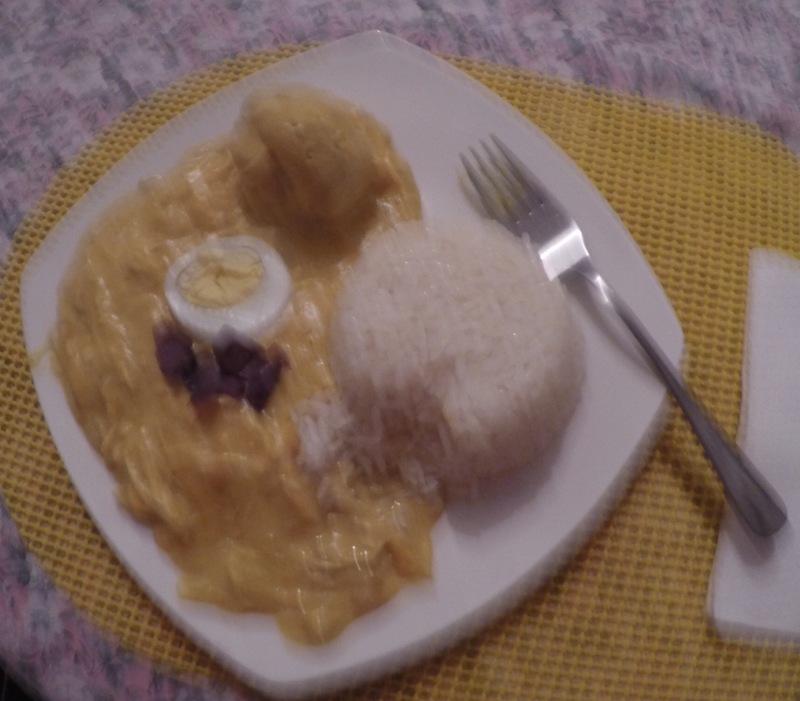 Aji de gallina: Karen and I both agree that this is the best meal we’ve eaten since arriving in Peru. Translated as “chili chicken,” this dish consists of a heavy cream served over chicken (or hen), potatoes and rice. Hard-boiled egg and sliced olives garnish the top! Aji de gallina. It’s blurry because Karen was so excited to eat it! 2. 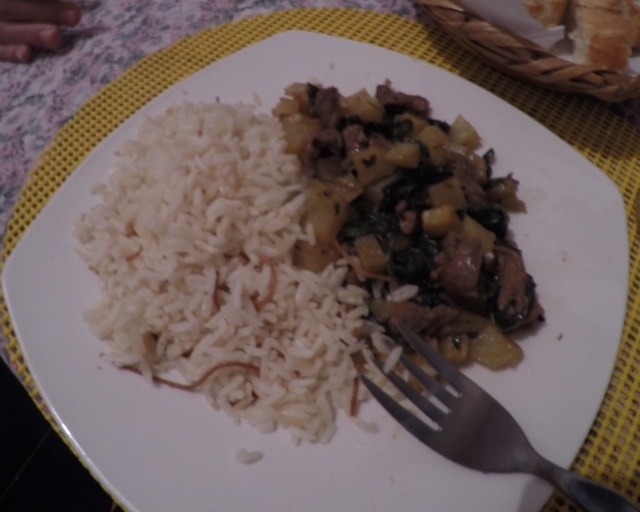 Bistec a la olla: Quite simply, “steak in the pot.” The steak is cooked in a pan and then served with a variety of vegetables and rice. 3. Cancha: Pieces of salted, fried Andean corn served as a side with some meals. It looks like a combination between fried corn kernels and corn nuts, but the taste is much better than either of those! 4. Chicha Morada: This is a Peruvian drink made from the purple corn that is grown in the area. It’s a very refreshing and much less-sugary version of fruit juice. 5. Inca Cola: Not food at all, but necessary to include on this list. The South American brother of Coca-Cola, this drink initially tastes like you’re drinking a gumball. But give it time and it may become one of your favorite drinks. 6. Lomo saltado: A local favorite (and the favorite dish of our host Manuel), it typically combines pieces of steak with onions, tomato, fried yellow potatoes and rice. Delicious! 7. Saltado de acelga: Very similar but less popular than its friend above, this has nearly everything that lomo saltado has minus the tomato and onions. It will likely includes sautéed swiss chard or a similar green for added flavor. Saltado de acelga. One of our first meals in Cusco! 1. Alpaca: Similar in appearance to a llama, these animals are used primarily for their wool and meat. We’ve seen some walking on the streets but have yet to see them on our dinner plate. 2. Cuy (Guinea Pig): This is considered to be the number one delicacy in Peru. Our host’s father has a birthday this weekend, and it’s looking like guinea pig might be on the horizon! 3. Quail eggs: These little hard-boiled eggs are peeled and served by street vendors all over town. Our next report will hopefully include follow-up on the “things we still have to try,” as well as a slew of other delicious Peruvian foods! So, here we are, whipping up espressos, lattes, milkshakes and orange juice on a daily basis. We’ve also had the chance to get to know the managers and owner of the restaurant, allowing us to deepen our understanding of their mission and exactly how we’re forwarding the cause. 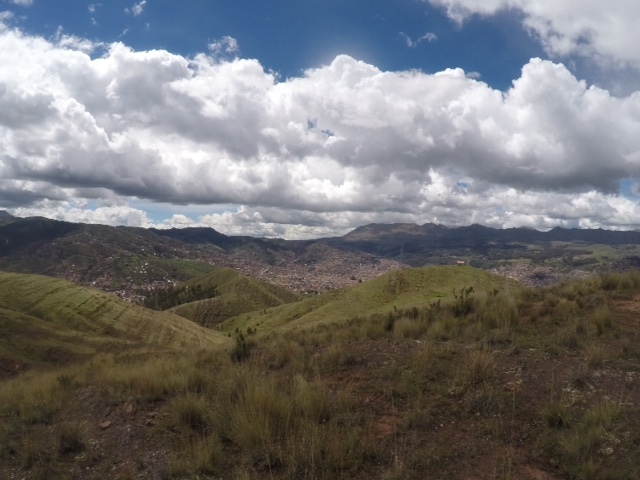 The primary mission (though they support other smaller missions as well) of The Meeting Place is to fund an after-school project in Altivas Canas, which is located on the outskirts of Cusco. The project purposes to “provide a place for children of single mothers to come and be supervised in a loving and wholesome environment, which allows the mothers to be able to go out and work. This helps the mothers to be able to provide for their children and household needs.” What a great cause, and one we are happy to support in a small way through the time we spend volunteering there. When we weren’t spending time at our “jobs” last week, we explored the city in some new and exciting ways. On Wednesday evening, we took a hike, literally, to see Cristo Blanco (White Christ). It’s a beautiful statue that overlooks much of Cusco and gives visitors an incredible view to gaze upon. Even cooler, is that there are spotlights surrounding Cristo Blanco, so when we look across the city at night we can see Him looking back at us! Friday afternoon symbolized our passion for exploring the world through running. Karen and I spent the better part of three hours hiking and running up and down the unblemished mountain peaks residing behind our house. There is so much picturesque land untouched by humanity, just waiting to be explored. The magnificence of the mountains really takes one outside of their personal “bubble” and into the boundlessness of God’s creation. The weekend involved more of the “cultural” aspects of Peruvian life. Once again, it seemed that in every instance we were the only gringos in sight. We visited Sabado Baratillo (the Black Market), which is only open on Saturdays and typically closes around lunchtime. Now, I want you to imagine something you might find at a market somewhere. Got it? Great, because so does the Sabado Baratillo! Some of the stranger offerings include live ducks, guinea pigs, kittens, and puppies, all of which can be had for the equivalent of less than one USD. We knew we were getting close to reaching the market when we saw at least one person every block holding a puppy! I have to admit, the thought of a $1 puppy was pretty appealing, but not the least bit convenient for our situation. So, if you’re looking for a bargain, send me a personal message and I’ll FedEx you a puppy. Just kidding…getting dogs through customs can be a real pain! Later in the weekend we found ourselves at Parque Zonal, a local multi-purpose sport facility complete with basketball courts, fútbol fields, a swimming pool and a track. I had been itching to hoop from the moment I saw a men’s league playing at a court on Avenue El Sol, one of the main streets in downtown Cusco. We headed over and I was able to play two-on-two with a few Peruvians I met at the courts. It’s a pretty neat feeling to know that sports can transcend culture and even language. I couldn’t communicate with these guys using words, but we communicated through the sport of basketball. It was definitely a memorable experience. What’s even crazier is that one of the guys I played with was wearing a jersey from the men’s league we watched earlier in the week! And wouldn’t you know it, the team was the “Buffalos,” with a team logo that was a clear imitation of the Chicago Bulls. The whole situation wasn’t a coincidence; it’s what I like to call a Godincidence. For the second straight week, Cusco didn’t disappoint. But we’re not finished. So much more adventure awaits!